Life was good and then life abruptly ended. A simple traffic stop somehow turned into Encinia slamming Bland to the ground, digging his knee into her back and hauling her to jail for “assaulting an officer.” Bland called her family after she was booked and was assured by her sister that the family would pull together the $500 needed to get her out on her $5,000 bail. When the family called three days later with the bond money, they were informed that Bland was dead. According to Waller County, she was found hanging from a plastic trash bag. Her death was ruled a suicide. Her family mourned and the nation erupted. #SayHerName became a viral hashtag, vigils popped up all over the country and everyone had questions. Encinia was fired and indicted for perjury for lying about why he had Bland get out of the car in the first place. In 2017, all charges against him were dropped. No one else has ever been indicted for any of the activities surrounding Bland’s death even though the county admits that the jail house log was forged. The officer responsible for checking each cell every hour did not do his job and forged the log in advance. Bland’s family received a $1.9 million settlement and Texas now has the Sandra Bland Act—a law that increases accountability and spells out procedures for how county jails handle inmates with mental health issues. Three years later and many questions still linger. 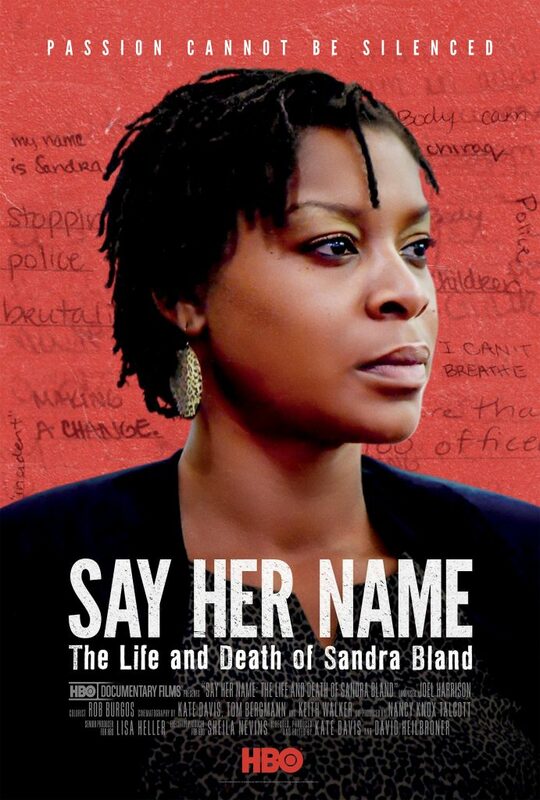 HBO’s upcoming documentary, Say Her Name: The Life and Death of Sandra Bland, reveals more details about the circumstances surrounding Bland’s death. The compelling film features interviews with Bland’s family and friends, the controversial Waller County sheriff, the county prosecutor, and other people who are key to the situation. Two of Bland ’s sisters, Sharon Cooper and Shante Needham, stopped by theGrio to talk with senior editor Demetria Irwin. One question that constantly surfaces in conversations about Sandra Bland is whether she actually committed suicide or if someone killed her and staged it to look like a suicide. In the documentary, Bland’s mother states unequivocally that she does not believe her daughter committed suicide. With Encinia free and no one else with any charges, Bland’s sister Shante Needham expressed what she would like to see happen in terms of legal repercussions. “I really wish there was a way that all of them involved could be held accountable and when I say held accountable, I mean go to jail, lose their jobs, lose their pensions, lose everything like we did. We lost what is most important to us. Now we have to deal with this hole in our hearts. Holidays will never be the same, milestones will never be the same. Someone needs to go to jail,” said Needham. Watch the interview for more from the sisters, including why they agreed to the documentary, their opinion of the Sandra Bland Act, and how they keep their sister’s legacy alive.